Mary Fields, an ardent baseball fan, gave flowers from her garden to each Cascade player who hit a home run. 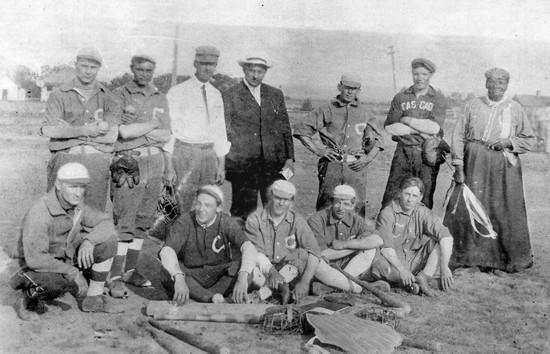 Mary stands at the right with a streamer in one hand and a cigar in the other in a team photo. Stagecoach Mary Fields has been gone for 95 years, but she hasn't been forgotten by the Missouri River town of Cascade. The town of about 800 still counts Mary among its favorites. For decades, she was a central and - at 6 feet and 200 pounds - imposing figure, baby-sitting nearly every child in town, carrying the mail, feeding the hungry for free and becoming the subject of a Charlie Russell work. Sometimes rough in manner, Mary was known as much for her heart as for her hard drinking, said Gwen Kircher, a Billings resident writing an account of three black Montana women who made their marks on the state's history. Mary was born a slave in 1832 in Tennessee. After she was emancipated, she went to work on steamboats on the Mississippi River. During that time, she met Judge Edmund Dunne, who was setting up schools in Louisiana. Through Dunne, Mary met his sister, Mother Amadeus, who was in charge of an Ursuline convent in Ohio. The two women became friends, and Mary went to work at the convent. Mother Amadeus came to Montana Territory to establish schools, including one at St. Peter's Mission southwest of Great Falls. When she came down with pneumonia, Mary traveled from Ohio to care for the nun and stayed on to work at the mission hauling freight, washing laundry, raising chickens and gardening, according to "More than Petticoats: Remarkable Montana Women," by Gayle C. Shirley. Stories abound about Mary's physical strength and no-nonsense ways. Mary became foreman of the other workers, one of whom didn't like taking orders from a black woman, according to a biography of Mary at the Cascade Web site, http://cascademontana.com. During an argument, the man hit Mary. As she fell, he reached for his gun. Mary grabbed her pistol and fired it but apparently didn't hit him. Those stories along with other complaints may have led to the bishop asking Mary to leave. She moved into Cascade and took a job driving a stagecoach delivering mail to outlying homesteads near Cascade. Then about 60 years old, Mary got the job because she was the applicant who could most quickly harness a team of horses. She became the second woman and first African-American to work for the U.S. Postal Service, according to the Cascade biography. True to the mail carriers' tradition, Mary didn't let snow, wolves or rough terrain keep her from delivering the mail. When snow drifts stopped the horse-drawn wagon, she carried the mail on foot. At one time or another, Mary ran a restaurant and a laundry in town. She was so generous that she had a hard time keeping the café open. When someone couldn't pay, she gave away the food. She might feed the hungry, but she didn't suffer fools gladly. One day when she was drinking in a saloon, she saw a man who hadn't paid her for laundry services walk by outside. Rushing from the saloon, she caught the man by the collar with one hand and, with the other, punched him in the face, breaking his nose. "His debt is now paid," Mary was reported to have said. She also cared for many children in town, earning her the town's affection. Because she was born a slave, Mary didn't know her real birthday, Kircher said. So Mary picked a day as her birthday. On that day, schools closed so children could attend her party. She was such a fan of the town's baseball team that she presented players who hit home runs with flowers from her garden. In turn, they made her a mascot for the team. She also would punch anyone in the mouth who talked against the team. In one photo of Mary with the team, she holds a streamer in one hand and a half-smoked cigar in the other. Mary was such a prominent local character that Charlie Russell, who lived in Cascade after he married his wife, Nancy, sketched Mary into "A Quiet Day in Cascade." In the pen-and-ink drawing, Mary has just been knocked down by a runaway hog. Cracked eggs spill from a basket that she's carrying. Kircher theorizes that Mary and Charlie may have known each other well. "I'm sure they drank together in bars," she said. Mary was called the White Crow by local Indians because she acted like a white woman, but had black skin, according to Shirley. Mary even knew Gary Cooper, when he was a small child. After he'd become a Hollywood star, Cooper talked about Mary with an Ebony magazine writer and recalled the .38 Smith and Wesson that she packed and the men's clothing that she wore under her apron and skirt. Mary baby-sat so many children that the last surviving one died at an advanced age just a few years ago, said Jackie Strandell, Cascade librarian. Some of the money that Mary earned baby-sitting, she spent on treats for the children for whom she cared. "She really captivated the hearts of Cascade," Kircher said. In 1914, when she was in her last illness, Mary walked outside her home and, not wanting to bother anyone, laid down in the tall grass to die. The mayor's sons, for whom she'd cared, heard her moaning and ran for help. After Mary died in Columbus Hospital in Great Falls, she was buried in the Hillside Cemetery in Cascade. Her story didn't end with her death. A few years ago, Cascade had a Mary Fields Day that brought some of Mary's relatives to Montana. The town still cares for Mary's grave, which Strandell decorates with flowers in the spring.